Community members can contribute comments, start discussions and ask questions (and in some areas, create ideas) in almost all parts of the community. 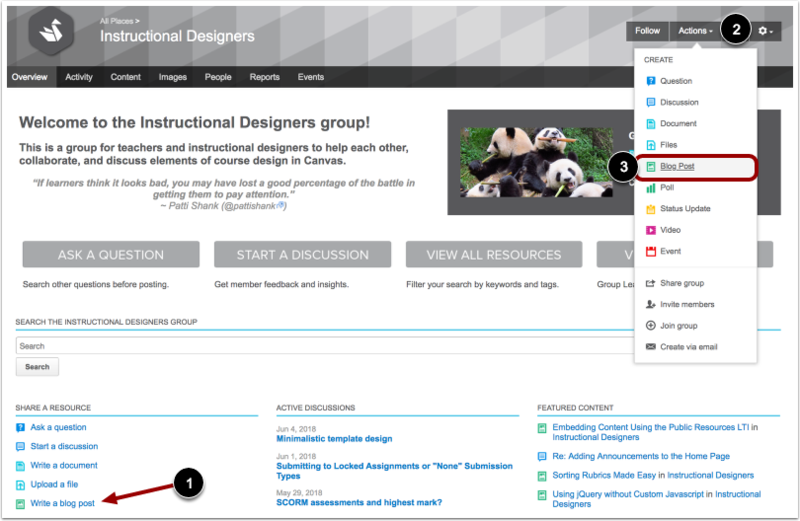 Additionally, members have more content creation tools within Canvas Community Groups. These include blogging, document creation, file uploads, videos, polls, and events. A group blog is a series of posts, written by different members of a group, that share various ideas, thoughts, or opinions about topics related to that group. Members can freely write about topics they feel passionate about. How do I author a blog post? On the group's home page, under the Share a Resource section, click the Write a blog post link . Or, in the Actions drop-down bar menu , click the Blog Post link . Add a title, text, and tags. If you want to publish your blog at a later date, you can post-date your content. Click the Publish button. For more information, visit How do I create a blog post in the Community? Blogging keeps the conversations timely and dynamic. Blogs give members a greater platform to share their thoughts, inspire conversations, and generate greater ideas. You can easily follow a group's blog and get all the latest updates from anyone who posts. What is a group document? Resource documents are intended to provide a series of how-to steps or processes or be a great source of information. Similar to Canvas Guides, documents may include anything from alternative solutions to deep dives into a Canvas functionality or feature. How do I author a resource document? On the group's home page, under the Share a Resource section, click the Write a document link . Or, in the Actions drop-down bar menu , click the Document link . What are the benefits of documents? Unlike blog posts, documents have a bit more functionality. You can co-author or collaborate on documents. Documents have versioning which is why they work well as information or resource files. As Canvas changes, you can update the document. Anyone following the document will be notified of the version changes. Because blogs and documents help showcase your reputation as a Canvas expert and build resources in the community, we absolutely reward these efforts. To learn more about ways contributing members will benefit from authoring content, visit What is the Canvas Community Reward System? Previous Topic:How do I attach a file to a content item in the Canvas Community? Next Topic:How do I create a blog post in the Canvas Community? 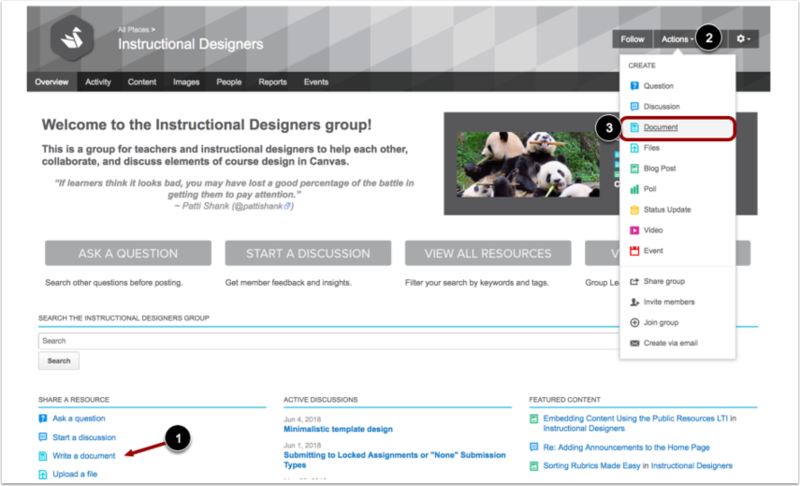 Table of Contents > Create Content > What is the difference between a blog and a document in Canvas Community Groups?